Complete, new bigger&better scans of the same comic uploaded 5 years ago (2009). Cover (1 page) Blood-Thirst of the Golden Tusk! Synopsis: Dr. Lane experiments with controlling the minds of animals. When two white hunters learn this, they want to steal the mind-controlled gorilla for themselves, but first, they want to use it to kill Kaänga. 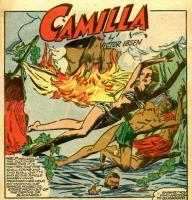 Their plan backfires, Kaänga kills the gorilla, and the hunters perish in a fall from a cliff along with Dr. Lane. Synopsis: Simba spoils Chief M'romba's antelope hunt and the chief orders his village to help him kill Simba. Simba evades the traps and the hunters and then, discovering M'romba's son in quicksand, leads the hunters to the boy so that he can be rescued. M'romba forgives Simba. 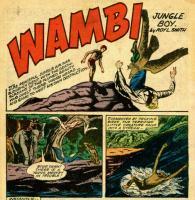 Synopsis: Wambi, aided by his bird friends, disrupts the activities of a white bird hunter who is collecting exotic feathers. Credits: Script: ? [as Roy L. Smith] | Pencils: Mike Peppe ? | Inks: Mike Peppe ? Synopsis: A woman posing as a geologist kidnaps the sultan and his daughter. Terry rescues them once he figures out the woman's ruse. Synopsis: Sata steals the power of mind control from an old witch in order to rule the jungle. 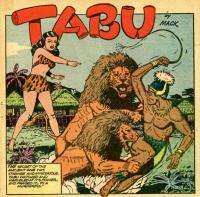 Tabu intervenes and restores the old woman's power and sees to it that Sata is banished. Synopsis: An animal identification quiz. Synopsis: Camilla thwarts M'bizi's efforts to prevent the wedding of Barong and Feda. Credits: Script: ? [as Victor Ibsen] | Pencils: Fran Hopper | Inks: Fran Hopper ? ; Ruth Atkinson ?